This Earth month, Recycling is one of the best activities to do with your kids. Using recycled materials saves money and saves the planet too! You can make amazing crafts with things that people normally throw out like plastic bottles. With just a little time and some supplies, you’ll be able to make a fun bowling game for your whole family using recycled plastic bottles. 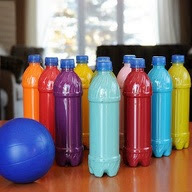 What you need: 10 used plastic bottles, paint (you can use one just one color or 10 different colors) and glue. 1.) Remove cap from bottles and clean thoroughly. 2.) Squeeze a small amount of paint in the bottom of each water bottle. 1 oz will do. If your paint is thick you might want to add a bit of water but not too much or the paint won’t be able to cover the bottle properly. 3.) Put the caps back on all your bottles and (let your kids) shake each bottle briskly to spread the paint all over the bottle. 4.) Remove cap and pour out any excess paint. Keep the cap off and allow your paint bottles to dry. When dry, put a little bit of glue on the lid and put it back on top so that your kids won’t be able to open the bottles. 5.) Set up your recycled bowling pins, grab a ball and have fun! If you have more fun recycling ideas for the whole family, don’t hesitate to share and comment below!